The lights adopted polycrystalline silicon solar panel which has sensitive light sensor and high conversion rate, it absorbs solar energy during the day and converts it into electric energy, then automatically turns on at dusk. Made of corrosion resistant glasses and iron for long lasting durability. This solar panel with latest polycrystalline technology has higher solar conversion rate. ABS plastic with IP65 waterproof grade, widely used in various environments. 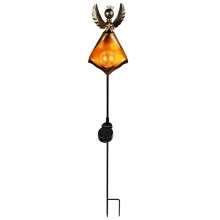 Retro solar simulate flame lawn lamp design, eye-catching. Without laying cables and paying electricity bills, safe and eco-friendly. Simulate flame effect, casting a soft and pleasant lighting on its surroundings. Perfect for any path, decorate your home driveway, walkways, garden paths, decks and patios.